Duquesne University and the Center for African Studies is proud to welcome special guest Immaculée Ilibagiza to our campus for a powerful presentation. For three terrifying months during the horrific 1994 Tutsi genocide in Rwanda, Ilibagiza and seven other women hid for their lives in the tiny, secret bathroom of a local minister. During that time, an estimated 800,000 people—including nearly all of Ilibagiza's family—were brutally murdered. Ilibagiza not only survived the genocide, but emerged as a fierce advocate for peace and reconciliation. 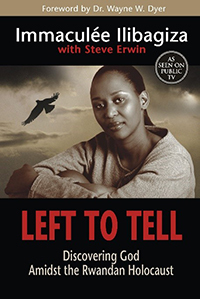 She has published several books, including the New York Times best-selling Left to Tell: Discovering God Amidst the Rwandan Holocaust. Join us for this free event, and hear first-hand Ilibagiza's incredible story about the power of forgiveness. Copies of Ilibagiza’s New York Times best-selling book Left to Tell: Discovering God Amidst the Rwandan Holocaust will be available for purchase at the event. Parking on campus is limited. Parking locations are available here. Free admission. Please RSVP here. For questions or additional information, contact the Center for African Studies at 412.396.2651 or africanstudies@duq.edu.